Belle de Couture: Green & Marigold. P.S. I wanted to say THANK YOU ALL for the love and support during the Nokia & Elle Search for The Next Style Correspondent contest. Yesterday I found out that I did not make the top 8 finalists that will be going to NYFW in September. Yes, I am bummed... BUT, I can say I'm really happy to have made the top 50 finalists out of thousands of entries. It was a fun experience. I am so excited for the 8 finalists and I cannot wait to see all their reporting from NYFW. Good luck to them all! We'll see who the grand prize winner is after NYFW! :) xo! I love how you have styled this colour! Im not sure i would be able to pull it off but you make it look so lovely! And that thrifted belt was such a good buy!! Sorry you didn't get through but you did so well to get that far!! Love all the colors! Very pretty. WOW love the mix of colours, the red shoes and yellow pencil skirt, love it! Oh, be still my heart...those heels!!! I may just have to get myself a pair of those asap! The rest of your outfit is perfect too, I love the colors and the statement necklace, you look so chic! Those shoes are PERFECT with the rest of the outfit. That belt was a great find! Is that the Maybelline Pink Freeze or Make me Pink you're wearing on your lips? I need a new lippie! Fantastic outfit! very beautiful! amazing colors! This is just great! I love it all, the colours, the heels ...everything. How did you manage to haul in that Dior belt for a mere $1.99? Who ever priced that needs their head examined. Score for you! 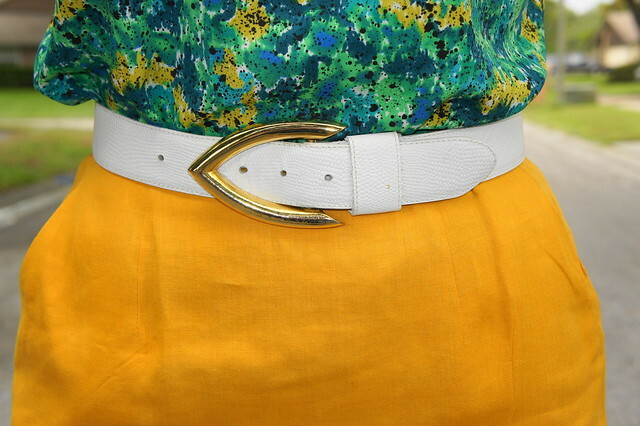 This is a great look - I love the brightness of the skirt. And what a find on the belt, lady! Nicely done. I love the white clutch.... and the outfit is no nice. I'm so happy I found your blog. I love your style! This outfit is stunning from the color of that skirt to the gorgeous shoes! you look great. i love your skirt! You look like the queen of the colour block!! POW! Pow! POW! I love all the colors. The look is so much fun. What pretty colors! Great impact.